Say It Like You Mean It & Support Animal Rescue! 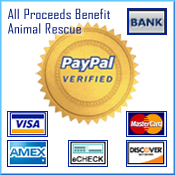 Click here, make a donation, and support small/indie animal rescue shelters, today! Thank You for caring and sharing. Free and inexpensive eCards help you save time, money, trees, and hassle. Traditional greetings, invitations, and announcements are so 1900s. And anything but green. New cards are added almost every day, and 100% of the proceeds benefit small animal rescue groups. Share happiness, spread joy, offer sympathies and heartfelt condolences, send invitations, or tell someone to get lost, but say it with one of our eCards and support small rescue shelters, now! Special thanks to eCardMax for making this possible! This eCard is FREE and so is basic membership! eCards may be sent by members only. Join FREE now!